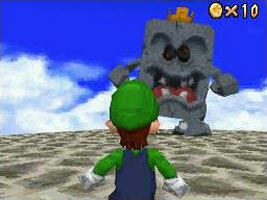 A remake of Super Mario 64 with all-new gameplay features, characters and touch screen controls. Mario, Luigi, Wario and Yoshi have to work together to find the Power Stars. You start out as Yoshi and have to rescue the other heroes. Before you find them, you can wear hats in order to transform into the other characters and use their special abilities. There are a few new levels, bonus rooms and boss battles in the game, increasing the number of available Power Stars from 120 to 150. Catching rabbits during the Adventure also unlocks touch screen minigames for that character in the "Rec Room". Super Mario 64 DS also features a multiplayer battle mode where up to four players can connect wirelessly to fight for Power Stars in arenas from the game.